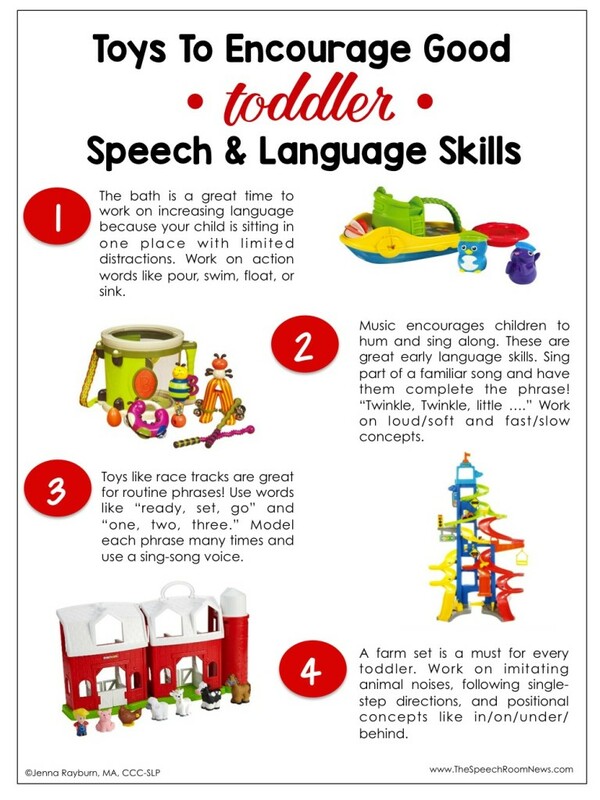 As Christmas and Birthday shopping lists are made, SLPs have the opportunity to recommend great toys to increase speech and language skills. I wanted to make some handouts to send home with my students this month. I made two different handouts. One handout is for toddlers and one handout is for preschoolers. You can find the free download in my Teachers Pay Teachers Store. These are my top four to recommend this year for my youngest students! The Little People Farm is a must and I love this bath fishing set. I use this music set and little people skywalk race track are on my ‘want’ list! I’m recommending lots of older classics for my preschool crowd! It’s always surprising to walk into homes and see a bunch of ‘gadget’ toys but no simple toys that encourage imagination (and language) skills. Theses plain Melissa and Doug blocks are the best. Every child needs a Baby Alive and the Melissa and Doug cookie Set. 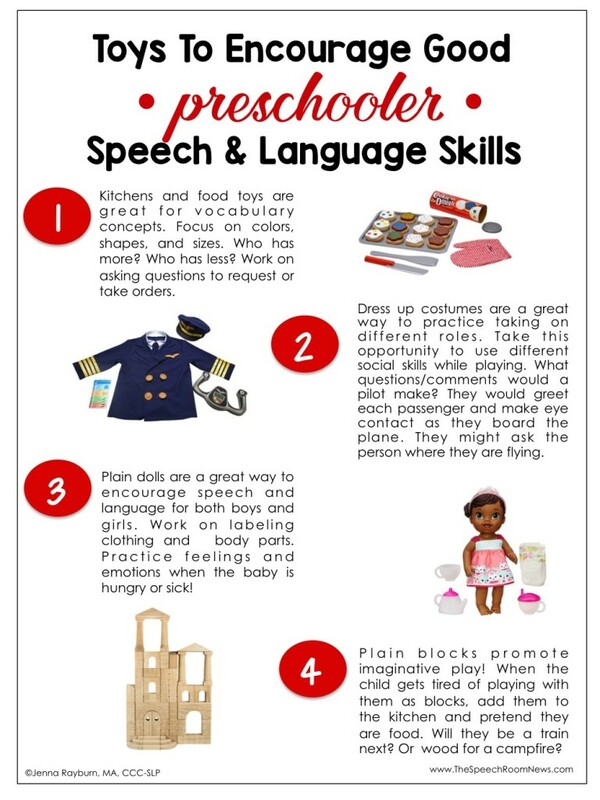 Lastly, this community helper costume set could be used SO many times throughout the year to work on taking roles and building language/vocabulary. What would be on your list of best toys to increase communication? Leave your recommendations in the comments below. Is there any way that you can post the first sheet in two versions. First as a Toddler sheet and a second time as a Preschooler sheet? I love sending home sheets like these with my students families but I work in a low incidence autism program where the toddler toys are still appropriate for my preschool students. I don’t like sending home notes saying toddler/infant toys since we are a preschool program. Love your posts! Thank you! Done! I didn’t change the pictures but if you go download the document again you now have the option of either toddler or preschooler on the first page! Thank you!!! You are amazing and provide such amazing resources for us to give to families and students~! Thank you so much for these!! I will be sending them home with my special ed. preschool class! Do we have your permission to give these out to parents? Just want to make sure. Thank you so much for this resource. It is wonderful to be able to share with parents, especially around the holidays! So excited to post this in my clinic.